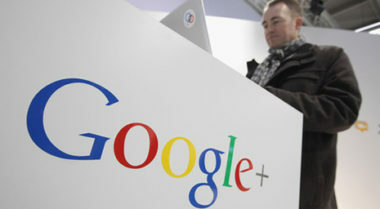 As Google steadily tries to secure more advertising revenue by gaining ground in the social network rivalry, its latest move involves the decision to make its Google+ network a requirement for people using the search giant’s other online services. Now, people who create accounts on YouTube, Gmail, and other Google properties will automatically receive a Google+ public page that is visible to anyone on the Web. The Wall Street Journal reported on Google’s bold attempt to take market share away from rival Facebook and how the move should ultimately promote greater competition in the social media space. Facebook has remained the leading social media network for some time, but Google has been aggressively chasing that title predominantly for the online advertising revenue that comes with it. While both Google and Facebook earn most of their revenue through online ad sales, Facebook has an advantage based on its ability to connect users’ online activities to their individual names and the names of people in their social media networks. This has made Facebook incredibly attractive to marketers seeking greater targeting capabilities for their digital marketing promotions. Google knows that this targeting data translates directly to dollars and believes that the social nature of Google+ is a direct route to this revenue stream. Now, Google believes that the fastest way to access this targeting data is by heavily integrating Google+ into its other popular properties. This integration is nothing new and has been slowly unfolding over the past year. In recent months, Google has only allowed people to write online reviews for products, services, and restaurants via their Google+ profiles. In addition, links to Google+ have started showing up in Google search results involving people and businesses with Google+ accounts. While reactions have ranged from praise for Google’s attempt to evolve with the social media age to concerns over personal privacy, the search giant is intently focused on pursuing even more integration with Google+ in the future. 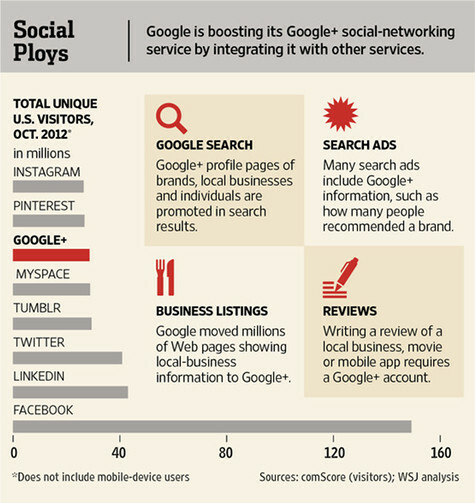 Ultimately, Google’s aggressive tactics at integrating Google+ into the online activities of users have already led to increased usage of the social network. Google reported that 235 million people used Google+ features in December, which is a huge jump from the 150 million people who used them in June. This higher usage has resulted in a goldmine of personal targeting data that Google knows is incredibly valuable to marketers. Since Google+ requires users to sign in before each use, the search engine is now able to steadily collect data about the websites they visit, ads they click on, products they purchase, and everything they do during their time online. In the interest of privacy, Google executives insist that they don’t share overly personal data about users, such as their names, but they do share information about the general online preferences and purchases of Google+ users. If Google can continue to increase usage of Google+ whether by requirement or preference, the search giant can continue to accrue the personal targeting data that marketers pay for and pursue. To discover the benefits of adding Google+ to your social media network, contact MDG Advertising. MDG Advertising, a full-service advertising agency with offices in Boca Raton and New York, NY, is one of Florida’s top integrated marketing agencies. Our 360° approach uses just the right mix of marketing to reach your advertising goals. While some industries may fare better in print and others online, we strive to create a balanced approach, where traditional, social media, and digital marketing efforts support each other and your message is tailored to the medium. To learn more about the latest social media trends in marketing and advertising, contact MDG Advertising.